One of my fav Aussie bloggers is Dani over at Hello Owl. Each week she hosts a little game called PUSH It is all about pushing your photography skills. I have been wanting to play along since she started it but for one reason or another I haven't as yet. Now I know that what I am about to post is not exactly pushing my photography skills as it is an incredibly crap photo. However just the fact that I have actually managed to put something together to play along has been a bit of a button pusher so here it goes. It just so happened that this week has seen me become the proud new owner of not one but two new pairs of shoes. As a rule I am a thong type of gal. Having lived all my life in the tropics having my toes enclosed is not exactly something that I am a fan of. The recent bout of cold weather however has shown me the upside of having enclosed toes. 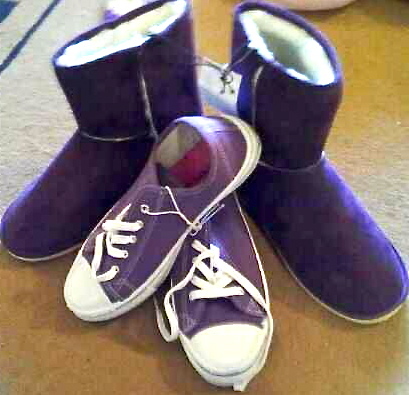 Now I guess you might think that having two pairs of purple shoes makes me a bit of a purple fan. This is not untrue but I did not go out of my way to choose shoes of the same colour. Both pairs, purchased from the same shop were insanely cheap. Like together the total price was under $13! Crazy hey? Wanna know the really crazy thing though? The sizes. The pretend Converse are a size 5 while the imitation Ughs are a size 9. Go figure.